Sweden: The Swedish Championships 2015, played from 5/15-17 in Gothenburg, Sweden, were won by Fredrik Blomback 6d (left). Second came Charlie Aakerblom 5d and third was Yang Huang 5d. Result table. France: In France several national championships took place in the commune of Cachan, in the weekend of 5/9-5/10. The French Championships in the category of Under 12 was won by Lexiang Sun 7k. Second came Ismael Fathallah 11k and third was Thibault Morel 16k. Result table. The French Championships – Under 18 – was won by Ariane Ougier 1d (left), big sister of Guillaume. Second place was for Sylvain Bousquet 3k and on third place finished Julien Dartigues 6k. Result table. 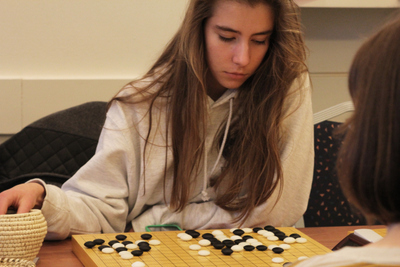 The second stage of the Main French Championships were played a week later from 5/16-5/17 in the city of Orsay. The victor was Mathieu Daguenet 3d, with Julien Miralles 2d in second place and Stephan Kunne 1d trailing in third place. Result table. Clearly investing in their youth players, the French also recently organised the Pau Youth Tournament, played on the 17th of May in Pau. It was won by Kim Schott Dedieu 15k. Second came Jade Rindlisbacher 20k and third was Axel Chadeau 20k. Result table. Russia: Another country that has recently been organising many local youth tournaments. On the 16th of May the third stage of the Youth Moscow Grand Prix took place in Moscow. 36 youngsters competed in the tournament, which was won by Anatolij Khokhlov 12k, with Roman Kolgushkin 14k in second place and Ivan Afanasjev 17k in third place. Result table. In the city of Tolyatti, the Cup of Tolyatti took place on the 17th of May. It was won by Robert Gorbunov 5k. Second came Nikita Semenov 9k and Nikita Allin 6k was third. Result table. The Children’s Group of the same tournament had sixteen kids fighting for the crown. Ivan Peshkov 10k came out as the winner, with Stanislav Arefjev 15k as second best and Alexandr Gurevich 15k in third place. Result table. The Championships of the Crimean Federal District, played from 5/15-5/17 in Simferopol, was won by Gleb Kajro 1k. Second came Demjan Zavgorodnij 2k and third was Nikolaj Zareckij 3k. Result table. Romania: The 6th Radu Baciu Grand Prix – stage 3, played from 5/16-5/17 in Bistrita, Romania, was won by Viorel Arsinoaia 2d. Second came George Ginguta 2d and third was Adrian Nedan 1k. Result table. Turkey: Turkey has been rapidly developing as a go country over the past few years, with more and more tournaments seeing the light of day and a big group of students playing the game. The 10th Hacettepe Tournament, played from 5/16-5/17 in Ankara, Turkey, had a total of 76 participants. 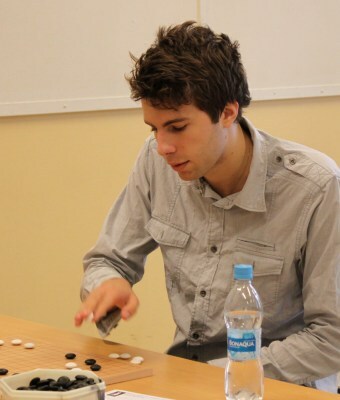 The best of them all was Engin Serkan Solmazoglu 1d who won all his games. Second place was claimed by Fatih Sulak 2d and third was Ilyas Tanguler 1d. Result table. Switzerland: The Veyrier-Ko Go Club Tournament, played from 5/16-5/17 in Club de Bridge des Bergues (CBB), Switzerland, was won by Chunyang Xiao 2d. Second came Semi Lee 2d and third was Longteng Chen 2d. Result table. Austria: The Go7 Samstagsturnier, played on Sunday the 16th of May 16-05-2015 in Vienna, Austria, had professional player Baolong Zhao competing as well as top Austrian player Lothar Spiegel 5d. As is often the case with handicap games, it does not mean that the strongest players automatically win. The tournament was won by Christian Bernscherer 5k who used his handicap stones to their maximum efficiency, with Alexander Huber 8k in second place and Lisa Mayer 3k in third place. Result table.